What makes this stand superior? With the nano-adsorption sticky suction mount base, it can provide the most stable hold for your tablets and cellphones. Prevent skid even on 75 degree slippery slope. The sticky base can be moved to other place without leaving a mark and it’s easy to clean with water and the adhesive remains. Compatible with all the tablets, mobile phones and e-readers, even with the smart case on. This tablet stand can conveniently adjusts to different viewing angles, ensuring you can enjoy the most comfortable viewing. The anti-scratch and anti-slip silicone pad can provide you comprehensive care. It’s convenient to charge your device with the charging port design. Made by Premium Aluminum Alloy, Lightweight but Solid. With the advanced manufacturing technology, you could enjoy the comfortable sense of touching and OMOTON provide you one year warranty. OMOTON, Better than you want! Superior Stability: With the sticky base made of nano-absorption material, the tablet stand has a strong and stable base that won’t slip even on a 75°slope. The sticky base can be cleaned easily with water without affecting the adhesiveness. Comprehensive Applicability: Compatible with all devices from 3.5-12.9 inch, especially iPad Pro 9.7, iPad Pro 10.5, iPad pro 12.9, iPad Air, Samsung Tabs, Fire Series and All Smart Phones and E-Readers. 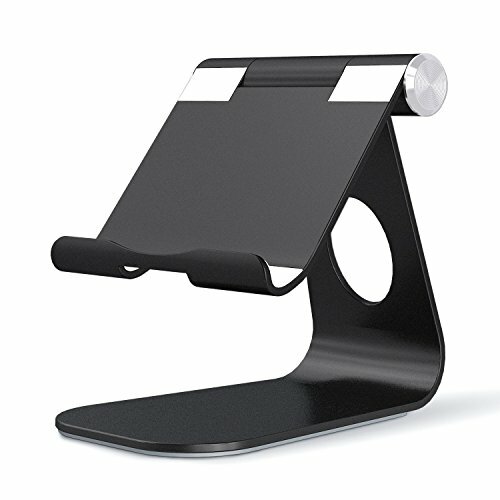 Multi-Angle: This adjustable tablet stand can hold your tablet horizontally or vertically and meet your demands of multiple viewing angles when using the tablet. Anti-Slip Pad and Charging Port: The anti-slip and scratch silicone pad provides your devices with comprehensive care. The design of the charging port makes it easy and convenient to charge your devices. A Good Choice: The durable aluminum stand is lightweight and solid. With a sleek and stylish design, the stand offers a comfortable and elegant touch. This tablet stand is the perfect gift for special events and occasions.